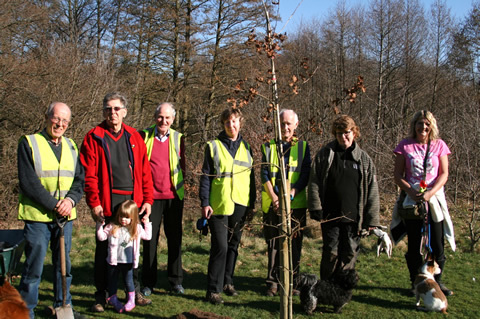 The group of dignitaries below were in the Carrs on Tuesday for a very mundane task, to plant a tree. But what a tree! One that commemorates 80 years of Manchester Airport. Long may she live (the one in pink wellies, I mean). The Carrs is parkland that follows the Bollin River for just under a mile from Wilmslow to Twinnies Bridge. It is Wilmslow's favourite walking ground, where, in the morning, there are as many dogs as people. Most of the town's children have run in the play ground on Chancel Lane and begged to be allowed to paddle in the river. After rare falls of snow, the Carrs' one grassy slope is ridden by sledgers and the parkland becomes a Bosch canvas of colour. In recent years, rumours of fish have surfaced and there have been sightings of anglers.